Here are some interesting learning and networking opportunities for November. November 3rd – 4th – Excelerate Experience – $50 off for Wake Tech. Use this special registration link. November 11th – Women in Tech Summit. Students attend for only $40. November 15th – 16th – 2017 Internet Summit – $100 off for Wake Tech. Be sure to use WakeTechEI promo code. Watch this spot for more deals and opportunities. Through the StartUp@WakeTech Initiative, entrepreneurship information is accessible for every student. Entrepreneurs and business professionals in our speakers bureau can visit classrooms to deliver one of four lectures. If you teach at Wake Tech and want a guest lecture on entrepreneurship for your class, email me at kagailes@waketech.edu with the class date, time, and location to begin the process. If you want to BE a guest lecturer, just complete a volunteer form . And I will be in touch to discuss the details. The technological power in smartphones is astounding and getting better with every new model. It seems like there is nothing that they cannot do. And we may all be getting mentally lazy as a result. I can no longer remember most phone numbers. Why should I? They are in my phone. There is no need to do math in my head. My calculator on my phone is just a finger swipe away. With auto correct, who needs to know the exact spelling of words. Just get close and the phone will fix it. Or will it? A recent incident reminded me that some things are best NOT done on our phones. A young man needed to send an email that could have serious implications for his future. I know this young man to be smart and an eloquent and effective communicator. But poor sentence structure, clumsy messaging, punctuation errors, misspelling, and words used incorrectly made it look like he was NOT very smart. The email did have the desired positive impact. A young woman was completing a scholarship application on her phone. Unfortunately, she missed some important check boxes and, therefore, also missed the scholarship. Both of these people were probably in a hurry. But Smartphones may not allow enough visual perspective on important communications and tasks. The screens are too small to provide context on where everything fits. And, if we are not very careful, auto correct can make some pretty interesting substitutions for the words we really meant to use. Fully embrace all of the productivity benefits and whiz bang capabilities of smartphones. But, for important communications, give yourself the best chance to get it right. Do it on an old-fashioned device like your tablet, laptop, or desktop computer. This picture begs the question ‘Should we offer a course on how to take selfies?’. But the occasion certainly needed to be captured and catalog ed. It was great to catch up with Edward Danyo, a graduate of the Wake Tech/Wells Fargo Center for Entrepreneurship’s fall 2016 Veteran’s Entrepreneurship Advantage (VEA) course; a special business planning course just for veterans, active-duty military, and military spouses. This course was first introduced introduced in 2015 as an experiment. We were trying to determine if there was value in offering a business planning course exclusively for a group, like veterans, who have a very strong shared experience. The experiment proved that the comraderie and shared values among people in the military (and we consider spouses as people who have served, as well) creates a special energy in the classroom. Thanks to funding from Wells Fargo, students attend for free and are served a meal before each class. Whenever possible, the food is purchased from a veteran-owned restaurant or caterer. The class is facilitated by a veteran business consultant. And most of the subject matter experts who appear as guest speakers also have a close military connection. Edward credits attending this class with his current trajectory as an entrepreneur. He attended the class to increase the momentum on his established business, Indigo Dynamic Network and it’s EZBookIt tool for leisure and recreation venues. After completing the class, the Center recommended him for the HQ LABs Accelerator, a collaboration between NC Idea’s Groundworks Lab and HQ Raleigh. 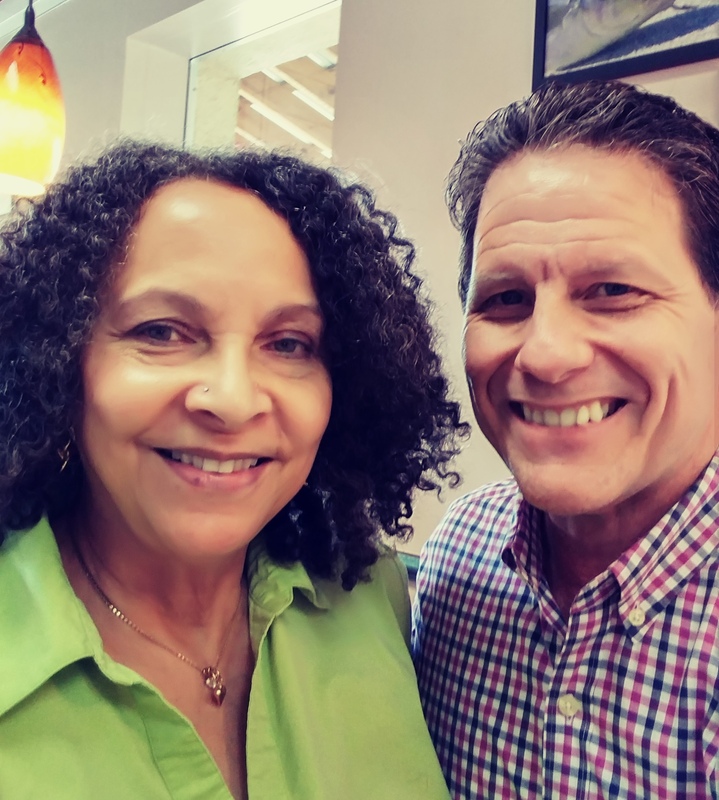 That experience led him and his business partner to pitch their new venture, the Hush Buddy, at the August 18th TechBreakfast. Congratulations to Edward Danyo on his entrepreneurial journey and continued success. The Fall 2017 Veterans Entrepreneurship Advantage (VEA) will be held on the Northern Wake Campus from September 12th – November 7th. If you are a veteran, active-duty military, or military spouse and are interested in receiving more information or attending this class just send an email to entrepreneurship@waketech.edu to receive registration information. You may me with your questions (kagailes@waketech.edu, 919-335-1004). The Wake Tech/Wells Fargo Center for Entrepreneurship welcomes the Fall 2017 business planning class. 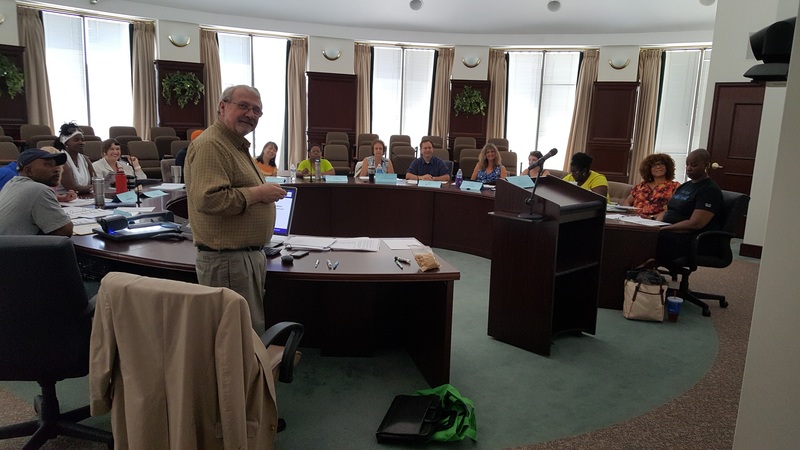 17 small business owners and entrepreneurs met for the first session of the Comprehensive Business Planning & Startup course on Saturday, August 19th. One of the largest classes in recent years is very diverse. It has 40% majority and 60% minority representation and includes three generations; Millennials, Gen Xers and Baby Boomers. Each class member is working on a different type of business; a clothing line for children, hydroponic farming, senior living homes, hat and wig maker, coffee & gift shop, interior design, and life coach…just to name a few. This diversity in class composition enhances the benefit each student receives and could create lasting customer and strategic partner relationships. They will invest 7 more Saturday mornings learning about and thinking through every element of their small business or startup. Expert facilitator, Jim Joyce of Sales Partners, Inc., teaches the class and draws from a rich pool of subject matter experts as guest speakers, to complement the curriculum. This is the 37th business planning course that Jim’s has taught in the Wake Tech/Wells Fargo Center for Entrepreneurship. The next class will begin in January but an exact date has not yet been selected. If you want to be on the interest list for the new course, please send an email at entrepreneurshi@waketech.edu . Contact Katie Gailes, Wake Tech Director of Entrepreneurship Initiatives, with your questions (kagailes@waketech.edu, 919-335-1004). This article about a company that was born in the NCSU Tech Incubator shows how game development and simulation can generate innovation and entrepreneurship opportunities. The Wake Tech Simulation and Game Development program helps fuel this industry in the Triangle by providing high quality, highly skilled employees to the over 40 local game development companies. But many of our students also have entrepreneurial aspirations. Those who transfer to 4-year colleges could immediately connect into their student entrepreneurship programs and incubators. One day, we may actually see a Wake Tech SGD alum in the Triangle Business Journal touting their cutting edge idea. Scot Wingo, Channel Advisor Founder and Chairman, created a chart to illustrate the entrepreneurial ecosystem in the Triangle. He included the universities in his diagram but he omitted the Community Colleges, the Small Business Centers and our Wake Tech/Wells Fargo Center for Entrepreneurship, a unique entity in the Triangle. I had something to say about his diagram. What do you think? Recently, I had the opportunity to see a high-end startup pitch contest, something similar to what you might see on Shark Tank. Eight startups had four minutes each to present their business to a panel of judges. Then they answered questions for three minutes. At the end of the evening, one startup had an extra $100,000 in the bank. These entrepreneurs were comfortable speaking in front of an audience. Or they did an excelllent job of faking it. They has obviously pitched their businesses many times because they were able to cover all of the points important to an investor in four minutes. All remained unphased during the three minutes of questioning by the judges. They had obviously been grilled many time before. Each entrepreneur had assembled a team of skilled professionals to work in and support their businesses. There were very few women and minorities among the contestants. Most were graduates, or current members, of one of the local incubators or accelerators. The pitch contest, called The Rise of the Rest, was sponsored by Steve Case, founder of AOL. RTP was just one stop on this tour. As we look at how Wake Tech would create an incubator or accelerator or build runways from our entrepreneurs into existing ones, this experienced reinforced my belief that communication is a key leadership skill for the successful entrepreneur, especially if they plan to court investors or major strategic partners. Farmers Need Business Plans, Too. It is easy to underestimate the complexity of farming as a profession. But it is one of the more challenging entrepreneurial ventures. After all, farmers are at the mercy of the weather, any number of pests and the fickleness of pricing in a global economy. In spite of the Farm-to-Fork movement, farmers are still not hot targets for angel and venture investors. However, to anyone who wants to support local businesses, know where their food comes from and eat more organically, farming is very important. And, with the right planning, farming can still support a family. That is why I was so happy to accept the invitation from the Interfaith Food Shuttle’s Farm Stand Coordinator, Beth Dobosy to speak with some of their beginning farmers about the importance of business planning. This was actually my second time speaking to a group like this. If they invite me again, I may have to schedule a special business planning course just for people in artisan foods or farming. Farming is still a family affair. In the audience were two husband/wife teams and an aunt/niece team. It was obvous that, in spite of the challenges, these entrepreneurs had a passion for their businesses and were proud of their products. I explained the contents of a standard business plan and the importance of actually having a written plan. Like most small businesses, what a farmer needs most is customers. So, we spent most of our time discussing costing, pricing, marketing strategies and customer retention strategies. Since what they sell is consumable, they have an opportunity to create repeat customers. In fact, the survival of their business depends on it. These entrepreneurs can use technology and social media to expand their reach and stay in touch with their customers. The successful farmer and artisan foods entrepreneur of the future must also develop deep skills in information techology tools and social media. This is where high-tech meets high-touch. It is the best of both worlds. Welcome to StartUp@WakeTech, the central source for news and information about entrepreneurship and startup activites among and for Wake Tech students, faculty, staff and clients. Businesses started by Wake Tech students, faculty and staff. 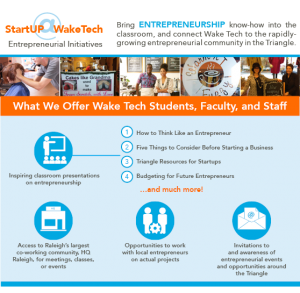 Wake Tech participation in local startup activities like pitch contests and networking events. Recommended and Wake Tech-sponsored events. The latest information on the StartUp@WakeTech Lecture series and how you can request a guest lecturer on entrepreneurship. Of course, we want to hear from you. 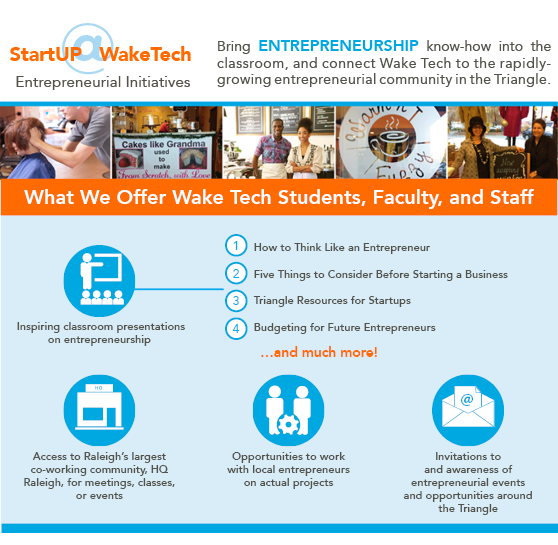 What entrepreneurship and startup activities do you want to see here at Wake Tech. Complete a Contact Us form or just leave your comment below.